The structure indicated is the first metacarpal of the hand. 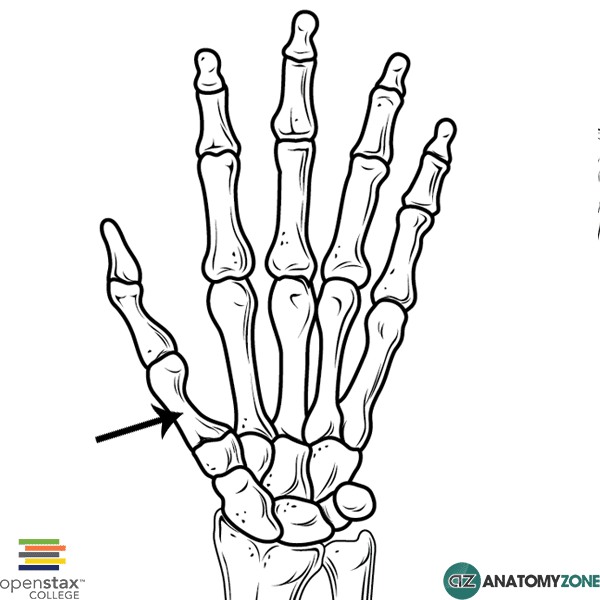 There are 5 metacarpal bones numbered 1 to 5 and are located between the carpal bones and the phalanges. The first metacarpal bone is associated with the thumb, the 5th metacarpal bone is associated with the little finger. The joints between the carpals and the metacarpals are known as carpometacarpal joints. The joints between the metacarpals and the proximal phalanges are known a metacarpophalangeal (MCP) joints. In addition, the bases of the metacarpal bones articulate with each other. The first carpometacarpal joint of the thumb is particularly important; the articulation between the first metacarpal and the trapezium bone forms a saddle joint and allows a wide range of movement, including flexion, extension, abduction, adduction, circumduction and opposition.